Tommie Howell is an award winning sculptor who resides in Connecticut. While having no formal art education, he credits his Junior High School art teacher with instilling the desire to create things out of blobs of color or lumps of clay. 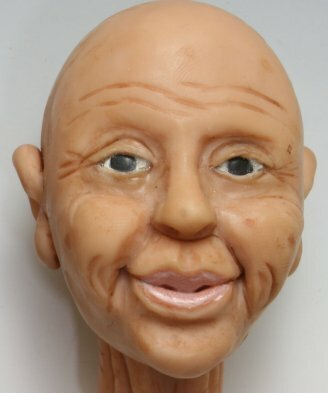 “I’ve always doodled, drawn, painted, and played around with art, but it wasn’t until my grad school roommate foisted (forced) a Sculpey III sampler pack on me in the 90’s that I found that thing for which I had been searching.” Tommie admits that sculpting didn’t exactly come to him naturally, but it was something that he wanted to do badly enough to stick with it. 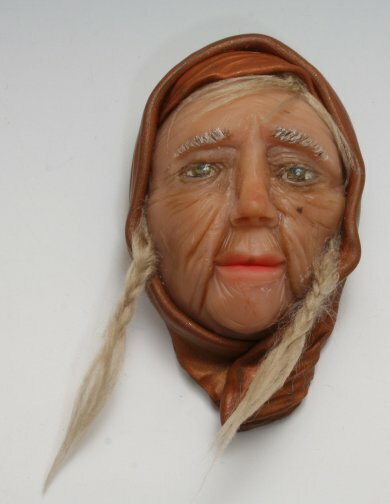 Stuck with it he has, and has made a name in the polymer clay and sculpting communities. He has won awards for his figurative sculpture on both the national and local levels, his work has been shown in places from local galleries to the Bead Museum in Washington DC. “I used to write more than I sculpted. I still get emails from people who find old articles I had written about polymer clay safety or artistic ethics. Finally I won a best in show award at a CHA event some years ago and was happy to be recognized for something other than having a big mouth.” Tommie has also taught in many venues around the country and we are pleased to have him join us at CFCF 2013. In this workshop, students will be provided with a proportional blank face that they will build upon to create their own one of a kind sculpted face that will double as both a framed wall hanging or table top ornament and a piece of wearable art. Students will learn basic art anatomy of the face and how to combine basic shapes into a complex, hand sculpted finished product. All skill levels are welcome. The workshop will not only produce a finished sculpt but will also provide techniques that can be used and built upon for many future projects. The instructor will have a variety of sculpting tools to loan during class and for sale in the store. Students are encouraged to bring any sculpting tools they own and while optional a pasta machine can be helpful for certain tasks. All clay will be provided by Polyform. Class will include a detailed handout that will cover not only the steps involved in the class but information on anatomy, tools, and a list of recommended products and suppliers to be used if the student chooses to further pursue sculpting as part of their polymer clay art. As each piece is one of a kind, photos provided are representative of what can be created and not meant to show exactly what will be made in the class. NOTE: This workshop will only be taught once during CFCF 2013.